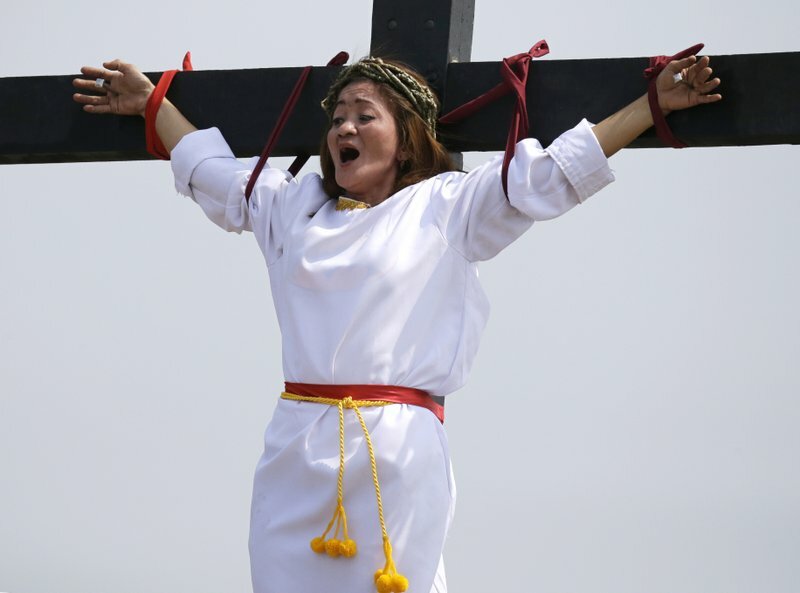 even Filipino Roman Catholic devotees, including a woman, were nailed to wooden crosses in a Good Friday reenactment of Jesus Christ’s suffering that was watched by thousands of spectators but frowned upon by church leaders. [post_ads]Three devotees wearing crowns of twigs were nailed to crosses by villagers dressed as Roman centurions on a dusty hill in San Pedro Cutud village, and four others were nailed to crosses in nearby farming villages in San Fernando city north of Manila, tourism officer Ching Pangilinan said. The Lenten rituals are frowned upon by church leaders in the Philippines, Asia’s largest Roman Catholic nation, especially if the events are used to boost tourism and business. The reenactments of the crucifixion, however, have persisted and become a tourist attraction in the largely unknown villages in Pampanga province, about 80 kilometers (50 miles) north of the capital. Friday’s reenactment of Christ’s crucifixion was the 32nd for Ruben Enaje, a 57-year-old sign painter who began his yearly rite after surviving a fall from a building. He plans to stop when he turns 60. Prior to the cross nailings, dozens of male penitents walked several kilometers (miles) along village streets while beating their bare backs with sharp bamboo sticks and pieces of wood. Some had their backs cut to keep them bloody.